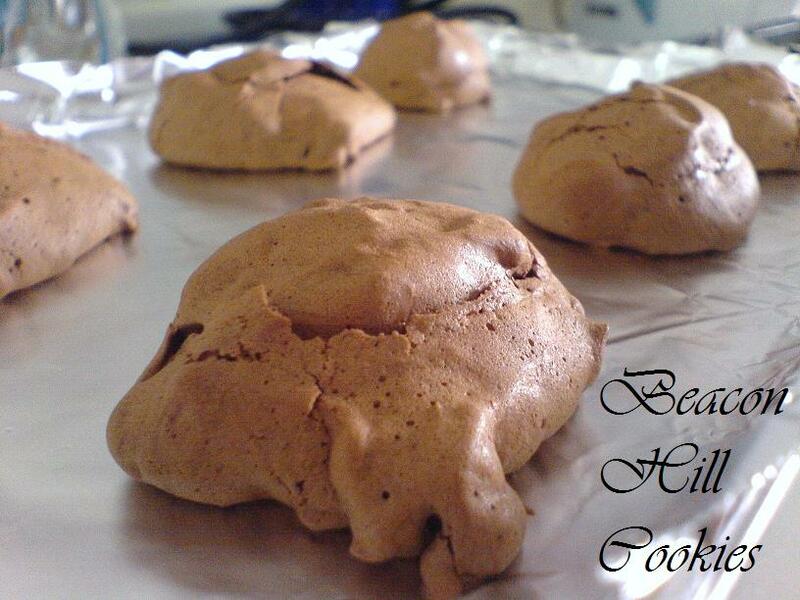 I decided to make these cookies because I had leftover egg whites from my Tiramisu. Luckily it’s a very easy recipe as I didn’t want to freeze the egg whites – I’m very sure that I will forget about them while they are in the freezer. These cookies have a very unique name – Beacon Hill Cookies (I wonder if they are invented by someone living on Beacon Hill or something). 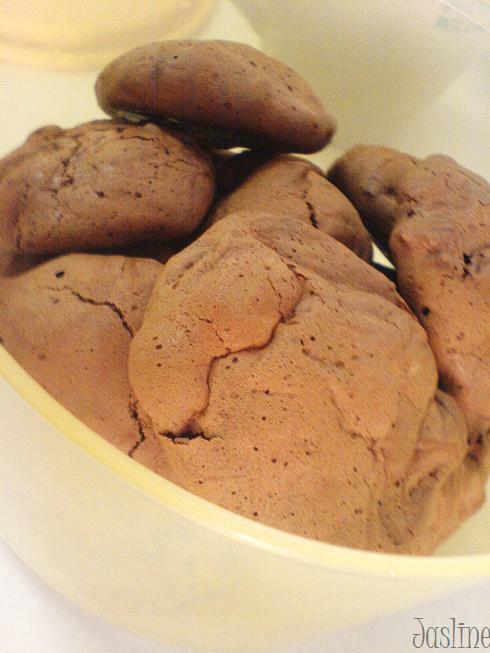 After reading through the recipe, I realised that it’s a meringue cookie – a chocolate one – with the main ingredients being chocolate, egg whites and sugar. I used the recipe that I found in 500 Cookies by Philippa Vanstone and substituted chopped almonds for the pecans – the presence of nuts gave these cookies a nutty flavour and a little crunch in these chewy cookies. I’m not a big fan of nuts but I guess a little crunch won’t hurt, and I’m glad that I cut the amount of nuts used to half as the batter is not a very huge batch. I wouldn’t have like to have cookies all filled with nuts. I would love to remake these cookies with a cinnamon variation – but I guess I’ll have to wait till I have leftover egg whites again. 🙂 It is a meringue recipe, hence if you are not a sweet-tooth, use a good-quality dark chocolate with minimum cocoa content of 60% (that’s what I used but I would probably use one with 70% cocoa content on my next try). Preheat the oven to 175 degrees Celsius. Line baking sheets with parchment paper. Melt the chocolate. Beat the egg whites till foamy on slow speed then add in cream of tartar and continue beating using medium speed till soft peaks from. Increase speed to medium-high then add one-third of the sugar gradually, beat for a further minute, then add one-third more of the sugar gradually. Beat until the egg whites are stiff and fold in the remaining sugar. Fold in the nuts, chocolate and vanilla into the mixture. Drop level teaspoonfuls of the mixture onto baking sheets, 4cm apart. Bake for 10 to 12 minutes until the cookies are cracked and firm to touch. Lift the parchment sheets onto wire racks and let the cookies cool completely. For tips on whipping egg whites and storing egg whites, joyofbaking has provided a very useful and informative site on them.